Meredith College, the largest private college for women in the Southeast, is a four-year, liberal arts institution located in Raleigh. It owes its origins to Thomas Meredith, who in 1838, along with other North Carolina Baptists, called for the establishment of a "female seminary of high order." It was not until 1889 that the Baptist Convention authorized such a seminary. In 1891 the Baptist Female University was founded under the auspices of the Southern Baptist State Convention, accepting its first students eight years later. The first graduating class of 1902 consisted of ten students. The school's name was changed to Baptist University for Women in 1904 and finally to Meredith College, in honor of Thomas Meredith, in 1909. The original campus was situated in downtown Raleigh in a building designed by architect A. G. Bauer. Continued growth in enrollment resulted in the building of a new campus, opened in 1925, at its modern site in west Raleigh. In Meredith's early years, its curriculum included graduate and undergraduate degrees as well as a preparatory school that taught students from first grade through high school. The graduate degrees were discontinued in 1911, and the preparatory school was phased out by 1918. In 1983 graduate programs in music, education, and business were established. In 2000 Meredith College marked a significant occasion in its history, electing Maureen Hartford as the college's first woman president. Meredith in the early 2000s enrolled more than 2,400 students from 26 states and 20 countries. While continuing its commitment to the education of women, the college enrolls men in its graduate programs, which include business, elementary education, and music. Suzanne Britt, Images: A Centennial Journey (1991). Mary Lynch Johnson, History of Meredith College (1956. 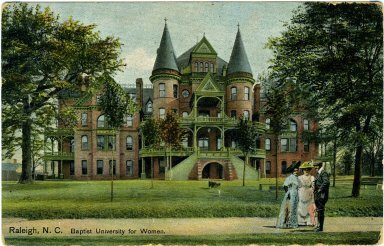 "Baptist Female University, postcard." Photo courtesy of North Carolina Architects and Builders: A biographical index. Available from http://ncarchitects.lib.ncsu.edu/people/P000040 (accessed May 2, 2012).